Preparation is a mantra of sorts for O’Brien, and one that has served him well. We sat down with the coach last week, on the eve of preseason practice, for an exclusive interview that looks back on a difficult but memorable 2012 season and hints at his expectations for 2013. The new season kicks off in just 24 days. Needless to say, Bill O’Brien is ready. TFL: Right to the point: How are you feeling about this team right now? O’Brien: We’re just so excited to get back out on the field and coach. It’s been a long time since we’ve actually coached. We love coaching these kids, and we feel really good about the core of this team. So we’re looking forward to getting out there. TFL: Coming off your first year as a head coach, I know a lot of people have asked you, “What did you learn?” I’m curious what you already knew—what did you believe about yourself, and your ability to do this job, that you were able to confirm in that first season? O’Brien: I knew that I was fairly organized, but at the same time, I had no idea how many things travel across your desk on a daily basis. Being organized helped me to segment my day—for recruiting, or academics, or marketing, and then obviously football. It helped having a basis, a knowledge of structure, before I got here. But I’m telling you, when you’re a head coach for the first time, it’s amazing what comes across your desk. And obviously, there were things that happened last year that no one, even veteran coaches, would have been prepared for. TFL: I’m sure that was something that sounded good, but you talked a lot about the importance of coming in with a plan, of really being prepared from the start. You had to be able to hit the ground running. TFL: Looking back, given everything that happened, how vital was that? O’Brien: It was vital that I was able to put together a good staff—some guys that had worked together, some guys hadn’t, but we got that staff in place pretty quickly. That was big. Getting [strength coach Craig Fitzgerald] in here right away was big, because he started the strength program, and that was a big part of it. You know, when you’re rising up the ladder as an assistant coach—if you don’t have a plan, you’re gonna be swimming. You’re gonna swim anyway, but you can keep your head above water if you have an idea of what you want. I knew Penn State would be a good fit for me, and I would be a good fit for Penn State, because I believe in the same things: Good, tough kids that go to class, play in a big, gray stadium that exudes tough football. And that’s what we want to do here. That was our plan, and we stuck to our plan. We’ve been good about sticking to our plan. We’ve made mistakes, don’t get me wrong, but we’re just looking forward to correcting the mistakes, sticking to our plan, having a good year this year. TFL: As you stuck with the plan—and I guess this is an obvious one—what was the biggest adjustment you had to make? O’Brien: Well, obviously, when the sanctions came out, that was a big part of the plan that we didn’t really anticipate. We anticipated something, but we didn’t anticipate that level of sanctions. So we had to change our recruiting plan, we had to change our practice plan, we had to change our style of coaching in a way—it was more about keeping the team together than it was about scheme, scheme, scheme. So there were things we changed on the fly. But that’s also having a plan, because when you’re a coach, in the pros or at a high level of college football, you always have to expect the unexpected. Especially when you’re a play caller. So that preparation really helped me. You know, I sat here, I watched the sanctions, I said, “Okay, here’s what we have to do to move forward and keep this team together.” And more than anything, we had a great group of seniors and a good staff that helped us with that. TFL: When do you feel you did your best coaching job last season? O’Brien: I would say as a staff, we did as good a job as anybody’s ever done at keeping a team together. We had kids that were being recruited by 50 schools—I know Donovan Smith had 50 scholarship offers. So we as a staff—not me; I’m talking about we, all of us, the staff, the strength coaches, everybody—did a fantastic job of communicating with the players, talking with them about what was great about Penn State, and what wasn’t so good at the time—being honest and up-front with them. I would say that was the best thing we did last year. TFL: And the flip side of that—I know you’re not a guy who dwells much on the past, but what decision or outcome do you wish you could have back? O’Brien: I’d love to have all the losses back. I’d love to have the first two games back. I think as a coach, whether you win or lose, you always think about plays you wish you had back. But you’re right, you have to move forward and think about the next play, the next game, the next practice. But there’s a million plays and calls I’d love to have back. TFL: There’s a sense of building optimism within the Big Ten right now—the league is recruiting well, and there are a number of relatively new, well-regarded coaches in the conference. Do you share that optimism, that the Big Ten is on the verge of reestablishing itself? O’Brien: No question. We have fantastic coaches in this league, sharp coaches, great universities, big stadiums. We will be able to recruit, all of us, our share of good, tough players. The Big Ten’ll be back. TFL: Everyone’s wondering about the quarterback, and I know you haven’t made that call, but I’m curious about the process. You’re a big baseball and basketball guy, and there’s a push in those sports especially toward analytics—digging deeper into statistics to make important decisions. How does that come into play with something like picking a quarterback, and how much is just trusting your eyes and your gut? O’Brien: It’s a little bit of both. We will definitely look at statistics, the obvious ones—completion percentage, mental mistakes, all those different things—but we’re also going to keep stats on decision making. How many good decisions did this guy make today? How many bad decisions did he make? How did he perform statistically in situational football—third down, red area, two-minute? And then you have to separate those from the intangibles. How is he in the meetings? How is he in the huddle? How are his teammates viewing him? Tyler [Ferguson] and Christian [Hackenberg], these guys are very talented, so I would assume they’ll be pretty even. We’ll have to make a great decision, a fair decision for our football team, and take a number of factors into account. TFL: You often talk about the men you’ve worked for who’ve helped you develop as a coach, and other football coaches you admire. I know you’re a big sports fan in general. Are there coaches in other sports who you watch and think, “I like how that guy does things”? O’Brien: Oh, yeah. No question. In basketball, I really look at Gregg Popovich. I’ve read some things about him, and I just love the way he coaches. There are other guys—in college basketball, to be honest with you, I really like the way Pat [Chambers] coaches. I’ve been to Pat’s practices, I think he’s aggressive, and he’s fair with his kids, and he’s a good strategist. Baseball, obviously I’m a big Red Sox fan, and I love what John Farrell’s doing. He uses statistics, but it’s obvious he also has a good feel for his team. TFL: Wally Richardson ’96, ’03g one of our great quarterbacks, came back to campus this summer to lead the Football Letterman’s Club. What do you like about Wally? 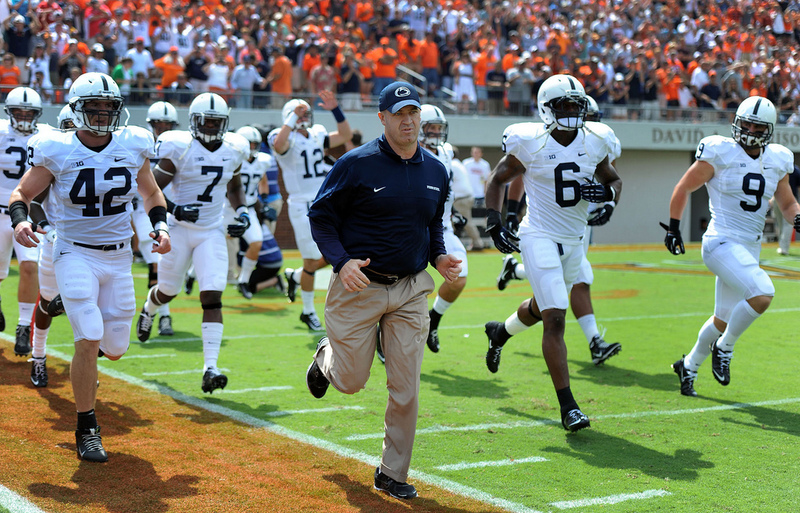 O’Brien: He’s a great ambassador for Penn State football, and he bridges a lot of eras. For whatever reason, mainly just his personality and his work ethic, he’s established a lot of great relationships with not only guys that played in the ’90s and the 2000s, but also guys that played before him. He was a guy that came highly recommended when Franny [Ganter ’71, ’73g] retired, that would be a great choice to run the letterman’s organization. I’ve gotten to know him, and he’s a fun guy, he’s got a great personality, and he’ll be a great addition to this athletic department. O’Brien: I saw the movie. TFL: Right—I remember reading Something for Joey in grade school. What are your memories of Cappy? O’Brien: I have memories, like you, of reading the book, and then obviously the movie, but also my dad talking about him. My dad loved Penn State football because of Coach Paterno, and for me, I love football that was played in the ’60s and ’70s. I’ve always loved the history of college football, and he’s such a big part of it. I’ve never met him, so I’m really looking forward to that this fall. TFL: Last thing—you were back on the Coaches Caravan this spring, and you talked a lot about fan support, the need to pack Beaver Stadium every week. Can you talk about why that’s so important to you? O’Brien: It means so much to our players, and I think it shows the world how strong Penn State is. When you show up to a Penn State football game with a full house, and it’s on TV, it’s just a fantastic atmosphere. And I would say to the alums and the fans out there, it’s just important to stick with us. We have great kids here, and last year was fantastic, but it’s only going to get harder from here. We’re not playing on an even playing field, and that’s just the way it is. We understand that, and we accept the challenge, but it won’t be easy. I think our fans need to be as resilient as we are, stick with us, and stay committed. I think if they do, they’ll see us come out of this thing in great shape. This entry was posted in Exclusives and tagged Bill O'Brien, Christian Hackenberg, Craig Fitzgerald, Donovan Smith, Fran Ganter, Joe Paterno, John Cappelletti, Something For Joey, Tyler Ferguson, Wally Richardson. Bookmark the permalink. Go get ’em Coach! Really looking forward to your chapter of the Penn State legacy. Nice interview. I just want to say about the “pack the stadium” issue. Since we are not playing on a level field, how about the hotels in the area lowering their prices during a football weekend? I usually fly from Florida to State College for a game each year – cost 300+. Buy 2 game tickets, cost 200+, but the hotel is 500 per night – for the Days Inn, the Marriott, Nittany Lion Inn, the Hampton Inn- any of them! That is 1500 before any meals, beverages, etc. If they would lower their prices, that would help.